The safety withholding hook RAI-FIX is a simple and effective device that prevents the tile/slab (set with adhesive) to fall down in the event of detachment from the wall. Indeed adhesives guarantee perfect anchorage of the tile/slab only if perfectly applied. But this is not always the case. Therefore, the safety withholding hook RAI-FIX is a crucial ally of the architect/designer (and of course of the buyer) to assure the maximum safety. In addition to that RAI-FIX expands the design possibilities since tiles and slabs of any size can be now used. Aesthetically speaking, RAI-FIX is the perfect solution since it is completely invisible once the façade is done. In fact RAI-FIX has to be placed between the tile / slab and the wall and therefore it is 100% hidden. The safety withholding hook RAI-FIX is made of stainless steel and can be used with tiles / slabs of minimum thickness 5 mm (0.20 inches). The installation is very simple and is carried out directly on the jobsite in a few seconds. * Regulations may vary from Country to Country. Therefore it is necessary to refer to the legislation in force in the area where the building /jobsite rises. The RAI-CUT device is part of the RAI-FIX system. 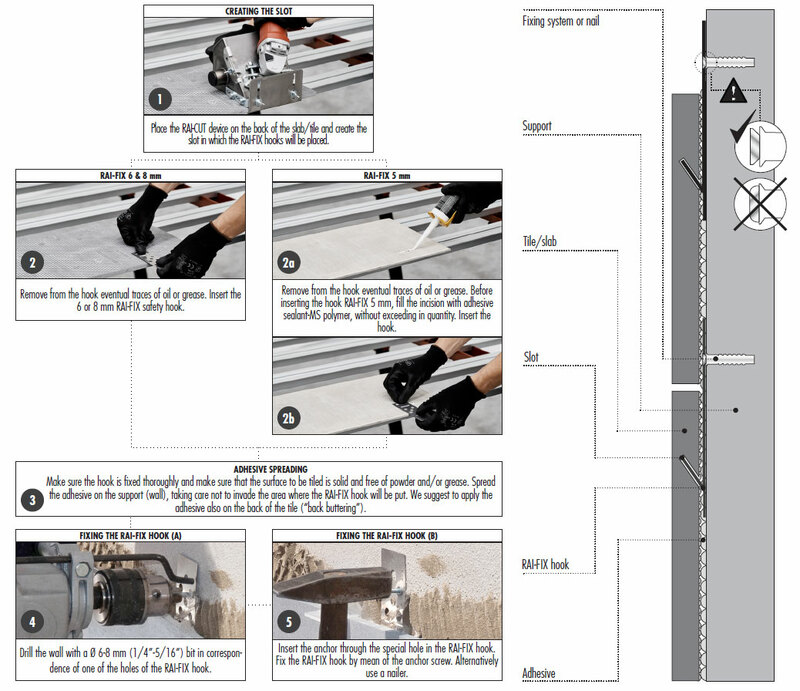 RAI-CUT is fundamental to create the slot in the back of the tile/slab. Slot where to insert the RAI-FIX hook. RAI-CUT works on tiles/slabs with minimum thickness of 5 mm (3/16”). 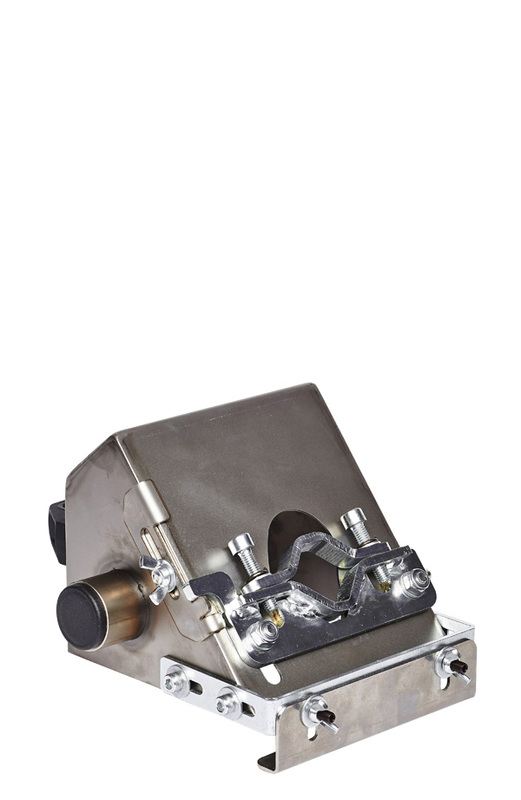 RAI-CUT is made of stainless steel and it is provided with clutch hole for connecting a vacuum dust extractor. 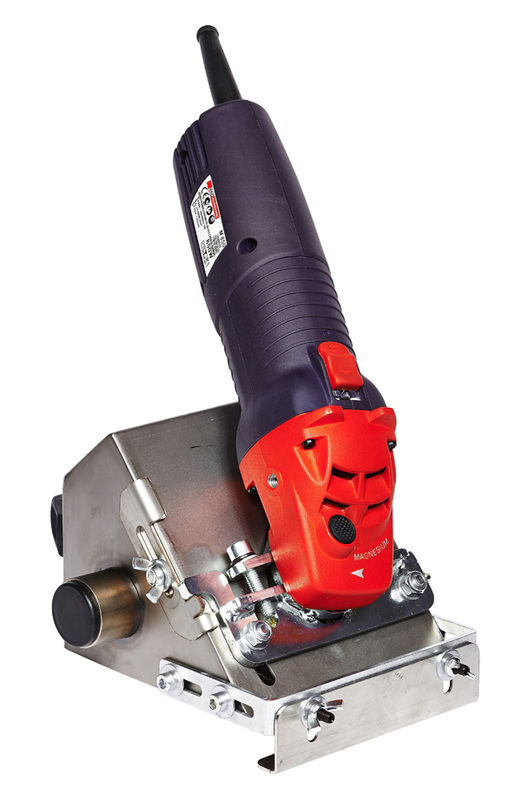 RAI-CUT can be supplied with or without angle grinder (power 900W). Thanks to its semi-universal attachment, RAI-CUT is compatible with the most popular brands and models of angle grinders. RAI-CUT cuts dry with diamond disc Ø 125 mm (5”).